Food and Drink in London: The Narrow Street Bar & Restaurant? The Narrow Street Bar & Restaurant? Three weeks ago I called The Narrow, Gordon Ramsay's new East End pub . . . did they have a table that evening? Of course not, such is the popularity of the celebrity that the earliest first sitting table offered was on Good Friday. I took it reasoning I'd have no problem finding people to come with me. Last Friday turned out to be a beautiful, sunny day, heralding the proper arrival of Summer. When Antonia and I arrived at the pub Ben was already sat outside, Jess turned up soon after. The first thing that strikes you is that it definitely has the feeling of a pub - there are people nursing pints outside, there's a short bar menu and there was a big slew of cigarette butts marring the terrace. The name of the pub had seemingly not changed from its previous incarnation: The pub's signs still announced it as the 'Narrow Street Bar & Restaurant', it's not a bar any more ,it's 'The Narrow' - a pub. Other things that strengthen its public house credentials are draught London Pride, they also promise a guest real ale, though this was not available when we visited. The menu and drinks choice are firmly British. As well as the draft ale, there's also a large range of bottles beers, including many British bottle-conditioned varieties. They also manage to include English wine (Chapel Down Bacchus Reserve), which even, Jess, an American, found acceptable. The menu is reassuringly short and seasonal (sides included Jersey Royals and purple sprouting broccoli). As it was a sunny Friday and we were next to water, I had fish: potted Cromer crab with toast, followed by deep fried monkfish with chips and mushy peas. Ben had grilled mackerel with potato salad and then pig's cheeks with mashed neeps. 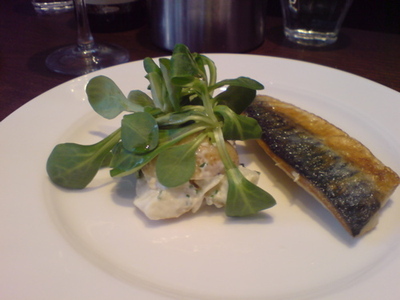 Jess had the same starter and then, despite Gordon Ramsay's well-known disdain for vegetarians, had the no meat, no fish main course . . . a cheese tart. Antonia is an actual vegeteranian and had predicted that her choice of dishes available to her would be poor. She was not wrong. As a starter she had Welsh rabbit (aka rarebit) and then followed that with the tart. The mackerel winners won the first round . . . the fish fresh and flavourful, the potatoes waxy, the lamb's lettuce offering a supple crunch. This is not to say that my crab wasn't good . . . it was, the crab in its lightly spiced butter piled nicely on to toast made from good bread. Antonia was pretty pleased with her rabbit but it didn't look as good as the one I'd seen at the St John bar a few weeks earlier . . . and that didn't look as good as the slightly over-the-top one I make at home occasionally. For main courses Ben won again. The pig's cheek was soft and melting and had a lovely robust flavour. The cheese tart was less successful with the pastry hard and the filling overcooked. More alarmingly,in Jess' salad there lurked piece of blue paper! What would Ramsay the perfectionist say? Or is this ok because it's a pub? We debated whether to raise a hullabaloo and we thought that Jess had a license to do this owing to her Transatlantic provenance . . . she declined though in the grounds that she didn't want to act like a a typical American and really she was pretty much a Londoner by now. Fair enough. For dessert, my choice of a gypsy tart was a mistake. It's a cloyingly sweet confection of dark muscovado sugar and evaporated milk. So . . . not really my thing and I shouldn't have been tempted by its name with its intimations of Romany lust. Nor could the suggested dessert wine hold up to the onslaught of sweetness. Antonia declined the school-dinner style desserts on offer and went for a Black Velvet. As to what Ben and Jess had . . . I'll leave them to add that in the comments. So, overall, what to think? Well, for a pub it's reasonable food . . . for me the whole project does have a slightly corporate, soulless feel. My complaint about Ramsay has always been to do with his lack of innovation, but that shouldn't be the main criterion in a pub. What do i want in a pub? Tasty food with a degree of comfort about it, a menu that makes sense, fresh ingredients and reasonable prices. The Narrow ticks all those boxes. What else does a pub need? Charm and character . . . Mr Ramsay needs to work on those.